So I know you’ve all seen the social media posts of people wearing what looks like a tanning bed for your face. I know what you’re thinking…tanning is so bad for your skin!!! But those are not tanning lights, they are LED’s, also known as light emitting diodes. LED lights don’t contain the harmful, cancer causing UV light that tanning beds do. LED therapy seems like the new craze especially in the Hollywood scene, spas and dermatology offices throughout San Diego are offering more LED services as they gain in popularity. In actuality, LED therapies have been around for decades. LED technology was first invented by NASA for plant growth experiments aboard the Space Shuttle in the ‘80’s. Although LED therapies for beauty and skincare have been around for years, they have gained new momentum with advanced technologies that have made them more accessible to professionals and consumers. LED therapy is the application of specific wavelengths of light that penetrate skin tissue to help obtain therapeutic benefits. LED wavelengths are absorbed by photo acceptors in the mitochondria of the cells in your skin. Through this process there is an increase in the production of adenosine triphosphate (ATP), which is the fuel that drives all cells. The most well-known types of LED therapy are blue light, red light, and near-infrared. Each wavelength penetrates different depths of the skin to produce various reactions in the skin and to help get a desired result. For instance, blue LED penetrates the epidermis or top layer of skin and is known to the kill bacteria that causes acne. Red LED penetrates into the deeper dermal layers and has been shown to enhance collagen and elastin production so is a great treatment for people that are working improving and evading the signs of aging, such as fine lines and wrinkles. Near-infrared LED penetrates into the deepest layers of skin and increases micro-circulation (tissue repair), decreases inflammation and relieves pain. Anyone can benefit from LED therapy; it’s even safe for teenagers. If you or someone you know who is battling acne, acne scarring, wanting to improve fine lines and wrinkles, or just want your skin to have that healthy glow, LED therapy is a great addition to your skincare regimen. Of course there is no such thing as a onetime fix solution to anything! The best long lasting results occur when used consistently overtime. 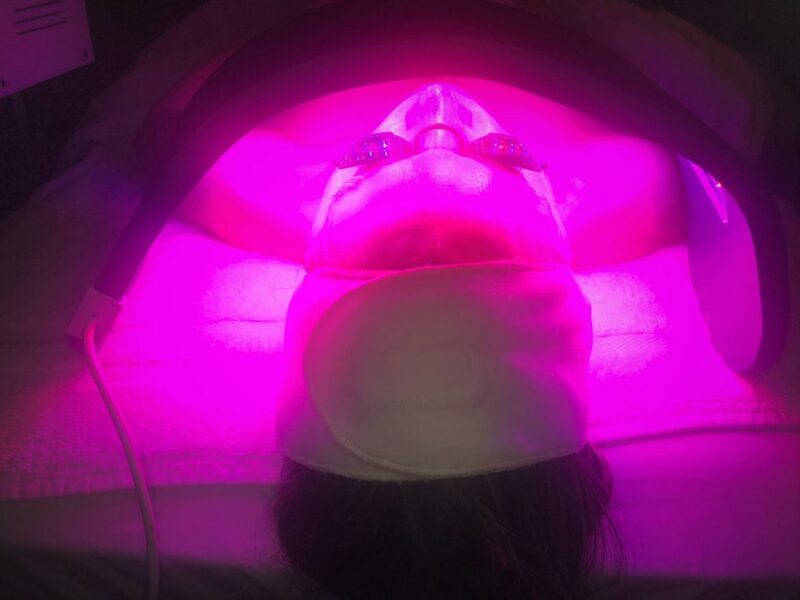 I love to incorporate LED therapy into my regularly scheduled facial appointments or if I’m pressed for time I’ll even do a stand-alone quick 30 minute treatment of just LED therapy. Because LED therapy is great for reducing inflammation and speeding up the healing process, it’s a wonderful treatment to have following other more inflammatory skincare procedures such as skin peels, microdermabrasion, dermaplaning, laser treatments and even plastic surgery. In recent years LED has really taken off as a beauty aid especially as technologies have improved and become more affordable. You’ll see LED therapy popping up all over social media, with Hollywood celebrities’ and in day spa’s and skin clinics. There are even beds of LED lights that help improve the skin and holistic properties all over the body and in every nook and cranny. Talk to a skincare professional to see what the benefits of LED can do for you and your skin.